Koots is located within a ball-toss of the famous Kooyong Tennis Courts, one-time home of the Australian Open. As the Australian Open is currently underway, it's appropriate that we are here tonight. First impression is that it is quite a small place - one room that seats around 40, although there is also an outside dining area. 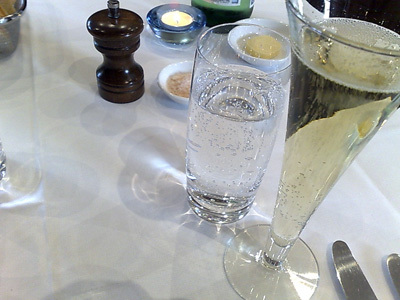 As we do enjoy our bubble, we order a bottle of 1998 Pol Roger. I think Elle would approve of these champagne flutes! The menu is also rather compact - a choice of 6 starters, 6 mains and 4 side dishes. 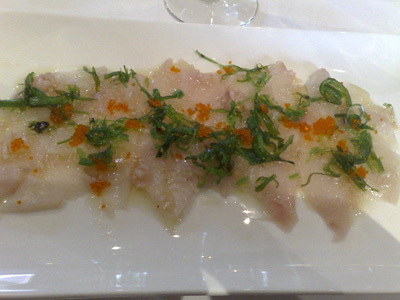 Paalo chooses the Hiramasa Kingfish, drizzled with a citrus sauce and topped with shredded wakame and flying fish roe. 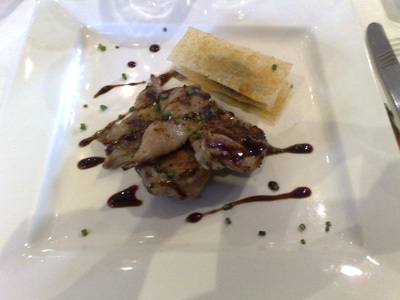 My starter was char-grilled quail with balsamic reduction and a mille-feuile of eggplant purée and tomato concasse. 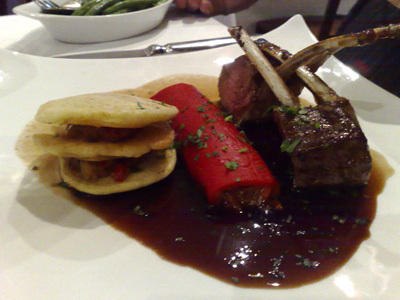 Paalo orders the Lamb rack with Capscium Cannelloni - the cannelloni is quite clever, they use the flesh of a roasted red capsicum to take the place of pasta. 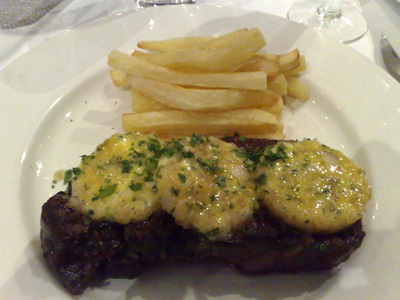 My Choice: 150 day grain-feed sirloin with bercy butter and hand cut fries. The bercy butter was excellent a mix of softened shallots, white wine and parsley and was solid enough that it was only starting to melt as I received the dish. The meat, though cooked closer to medium than rare was well flavoured and tender. 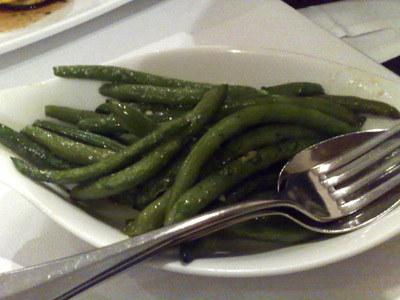 We chose a side of these simple green beans, arriving piping hot and still with a nice bite to them. They had obviously been flashed cooked in a really hot pan. 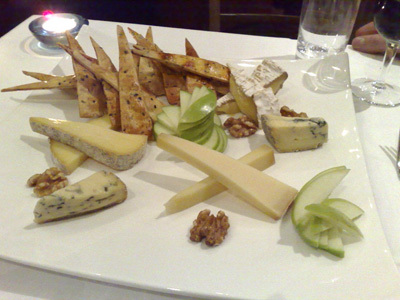 The cheese came out at the perfect temperature - it has obviously been sitting out of the fridge and so was at it's best. The last thing you want to have is cheese served cold. 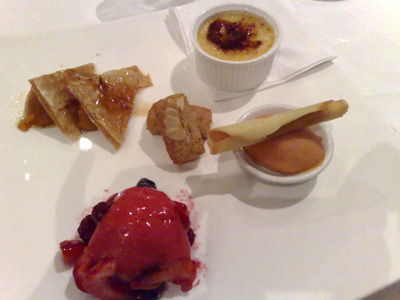 From top, going clockwise: Creme Brulee, Peach sorbet, Strawberry and Berries with Berry Foam, Apricots Mille-feuille - in the centre Almond Financier. A much more reasonably sized dessert than that offered at Wildflower. The only thing that was a bit off-putting was that the restaurant was empty by 10pm! The waiter, when serving the dessert, told us it was normal for them and that there was no rush for us to finish. Overall, the food was enjoyable, the service efficient. We will probably return and see if we can make it to 11pm! This is just around the corner from me so I'm pretty tempted to give it a try after your review!